Visita guiada al Santuario de Mi Hijo y al río Thu Bon. Incluye un almuerzo ligero en el río. Place is amazing, tour guide was OK apparently, he was himself late for meeting point back to the bus for half an hour, but maybe he had a reason he didn't share. My Son is pretty crowded, so if you want to catch it while empty - before sunrise, chose another tour. We went back by the boat, which was small but cozy. The advised lunch was light but yummy. On the way back we stopped in the village where they produce traditional wooden stuff, but nothing you could really buy and bring home, unless you are not traveling by car. Easy pick up from airbnb. Stayed 3km from city centre. Tried calling in the morning, and they could not confirm the address, and language barrier was a bit difficult. They said that they would pick me up at the allocated time. Tour was good, and speaker was very funny and wonderful. Still quite a large group, and not much food selection at My Son. Best to pack snacks, and lots of water. The only reason this doesn't get 5 stars is because it would be better to go in the morning. It was HOT. That said, our guide was hilarious, very knowledgeable, and entertained us the whole way. 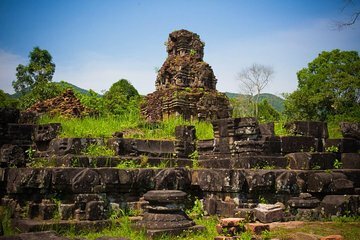 These are the temples to see in Vietnam, and this was an excellent trip. Well worth it. Booked this Booked this for family of 10. The agent was Footsteps Travel Hue on 084543933266. The driver came late and looked angry, raising his voice. He was rushing to pick everyone else up. Arrived in My Son realized we were joining a bigger tour for the holy land. Totally not what we expected. There were 1 guide to more than 30 of us. We could not hear clearly and were left behind in some of the sites/explanation, as it was kind of impossible for the guide to look after such a big crowd. Great tour, good service provided. Host was very friendly and knowledgeable. It would've been nice to have some "free time" at the temples but I understand how this would be difficult given the number of people there. This trip was an enjoyable way to see the sights. It's a big group tour (expect about 30 others with you) so less personal than a small group tour. BUT you get what you pay for, this was excellent value for money, and I recommend it to others.